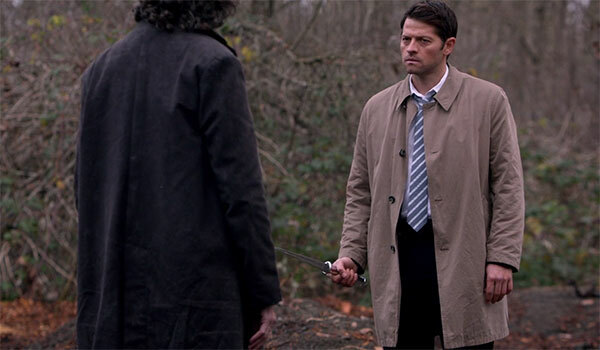 Castiel’s clothing style is pretty obvious – a trench coat and two piece suit. Almost the exact opposite of Sam and Dean, Castiel’s clothing doesn't change much throughout Supernatural. Luckily for me (and everyone else who’s interested in what clothes Cas wears), one of the costume designers from Supernatural tweeted out a picture of Castiel’s wardrobe tag from season six, episode 22. Castiel’s original trench coat was made by Stafford and sold by JC Penney. Don’t get your hopes too high though, just like with a lot of Sam and Dean’s clothes, Cas’ trench coat isn’t sold anymore. Interested in the last option? I found two trench coats on Amazon that look pretty close I think. This classic trench coat is probably the safest one to buy, it looks the closest to Castiel’s out of the two I found. If you’re not too worried about being as screen accurate as possible, I really like this modern-looking full-length trench coat. In case you didn’t read the wardrobe tag up above, Castiel’s suit is a charcoal gray two piece with a three button jacket. As usual, the exact suit isn’t sold anymore. But thankfully you hardly ever see Cas just wearing the suit (without his trench coat), so you can get away with a lot here. ​Personally, I’d probably go to a local brick and mortar store like JC Penney to find and try on a suit for a Castiel costume. But if you’re comfortable buying it online and know your measurements, Amazon has an awesome selection. My personal favorite after doing some searching is this charcoal gray, three button, two piece suit. If that’s not your taste, I’m sure you can find something on Amazon’s site, that was just the suit I liked the most. Thankfully Castiel’s boots are still sold brand new. These black Blundstone slip on boots are still sold on Amazon. The wardrobe tag doesn’t give the exact model of Blundstones that he wears, but just by comparing screen captures with these boots, they look identical to me. The wardrobe tag’s description of Castiel’s boots and the look and description of the Amazon page for these boots also seem identical, so it’s a safe bet they’re the same exact boots. ​If you don’t already own a black dress belt with a silver buckle, th﻿is Nautica dress belt would fit perfectly (and it’s reversible too!). In the newer seasons, Castiel’s clothing has changed just a bit. Instead of a full length trench coat, he now wears a hip length trench coat. His suit has also changed a bit too, it’s black now instead of charcoal grey. ​Unlike his original clothing, I wasn’t able to find anything official about what brand his new clothes are. As far as his suit goes, you can go with the same one I recommended befor﻿e, but just go with black instead. If you find a better match, please share it with everyone in the comments below. ​Last we have Cas’ new tie, which is now a blue and white striped tie instead of a solid blue. I found a couple of really close matches, the first being this Retreez blue and white striped﻿ tie, and the second is this Baxbo blue and white striped tie. ​To be completely honest, I was a bit disappointed I wasn’t able to find more trench coats that matched Castiel’s…but at least we got exact matches on his shoes. Are you going to SLC FanX? It’s at the beginning of February, end of January, and I’m going, as Castiel, hence why I was here. Thanks! Even though they don’t sell it anymore, is there any way I could still purchase the exact coat made by Stafford? Maya, you’d have to find it used somewhere like Ebay, thrift stores, etc. Haha, that’s awesome Jared 🙂 I think with most of the clothing from SPN that thrift stores and army surplus are where you should check first. Dear people here who are fans of the trenchcoat. I found this the coat that comes really close to the original coat. Of course there will always be some small things, like the button on the shoulders that should not be there. But i bought this one recently and i think it comes really close. For the first time in a long time, I decided to do something for Halloween, and I finally decided on Cass. I’m female (obviously), so I want to do something that’s pretty close to his outfit, but with a girly side. This article was super helpful! I’m trying to track down the trench, I’ve got the tie lined up, and the rest should be simple. Do you think I can get away with a black suit instead of charcoal? Thanks! I’m sure you’ve decided by now, but it’s really personal preference. For “screen accuracy”, we know his suit is the color charcoal. But since you can’t really get the EXACT suit he has anyway, it really is up to you. Hi Matt, is there a particular outfit you’re looking for? Cas wears quite a few different things throughout a lot of the seasons, but he still generally sticks with his charcoal suit and trenchcoat. Oh ok, I wasn’t sure if you meant one of his “human Cas” outfits or the new trench coat. As for his new suit, it looks like it’s just a black suit instead of charcoal gray, so you could just go with the same suit but in black instead. We just found shoes, white Tommy Hilfiger shirt, blue tie, black pants, and a trench coat at our local Goodwill store. The trench coat looks amazingly like Castiel’s except the buttons are light tan. It was $15.00. Everything else was less. Thanks for this detailed information. We still have to find a charcoal jacket. Thanks for this helpful site. My daughter wants to dress as Castiel for Halloween. We got really lucky this afternoon! Your site is very helpful! I’m being Cas for Halloween and I was wondering if Cas has any special, distinct marks? Like how Dean has Cas’ hand print from Hell. Not that I can think of, I’m pretty sure Cas is scar/mark free. There might be episodes/times after being tortured or something, but he always (as far as I recall) ends up getting healed or healing himself. Heyo, would you be able to do a guide on Castiel’s new look? With the single breasted trench coat and stripey tie. Hi Wade, I actually meant to do just that a while ago, but it slipped my mind. Hiya, I’ve found a Season 9 – onward trench coat on Amazon, it’s a little more on the expensive side though.